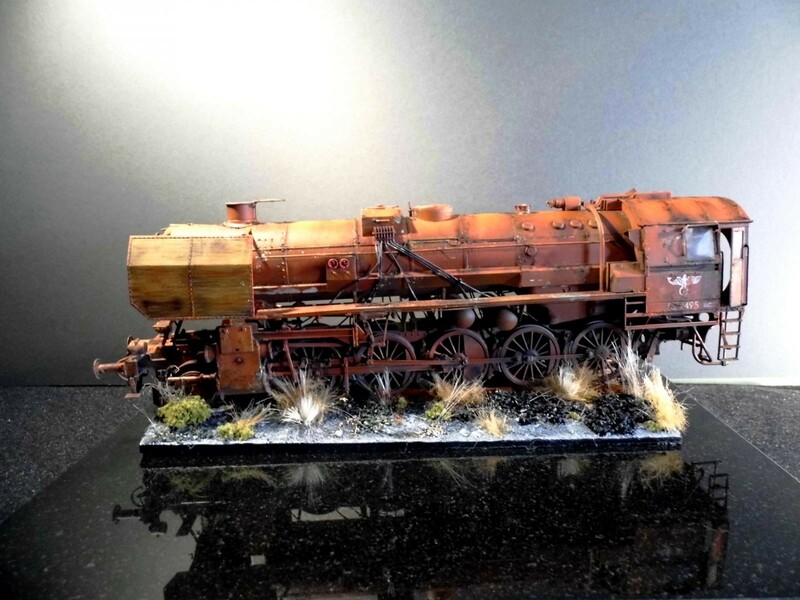 This is Trumpeter’s 1/35 Baureihe (Br-) 52 Kriegslocomotive. I first posted the build three months ago as “End of the Line.” I had intended to dress the landscape areas more thoroughly at that time but never seemed to get round to it. Now, whilst waiting for a new WW1 project to arrive, I finally found the window to address the issue. That, and a new DSLR camera, have given me leave to present a new photo sequence that I hope will be of interest. A further reason for reposting is that the various processes I used to get the multiple effects of rust and and other metal degradation seem to have continued apace after the model was put away. When I removed the dust cover (just a bit of plastic film, really) the further changes to the surfaces were apparent. Choo Choo! Get Your BR52 From Amazon! 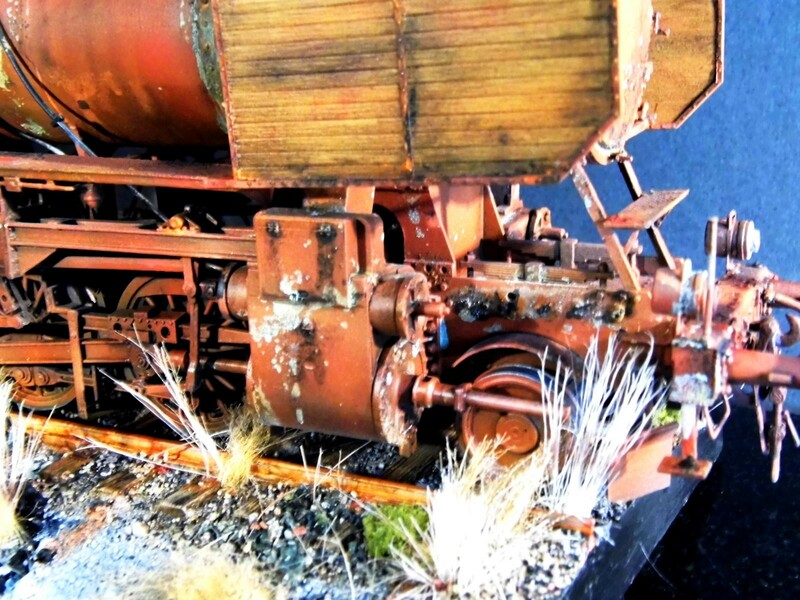 Beautiful weathering Rob, amazing work! Do you mean the rust building continued or what is your 50 cents on what went on “under the hood”? 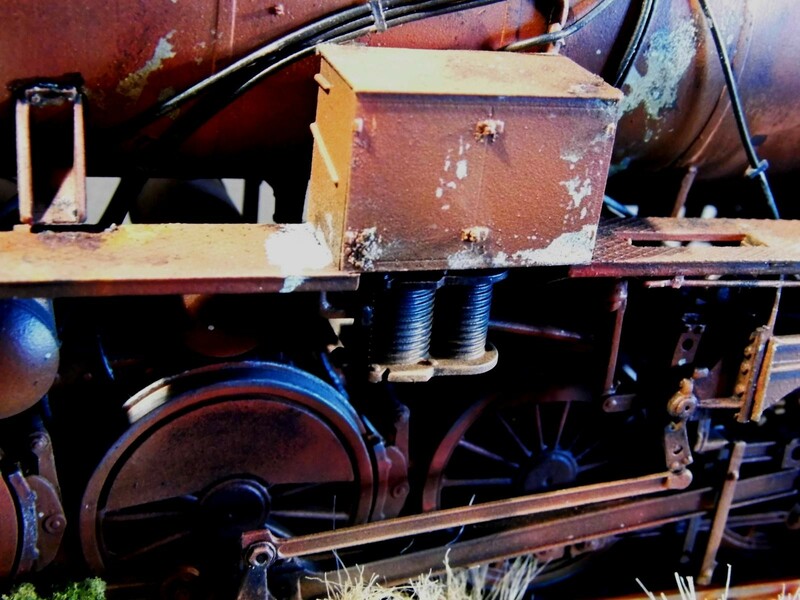 One of the rust treatments was the Deluxe system using a binder, iron particles and activator. The activator certainly worked overnight, but the chemical reaction appears to have continued after the model was stored away. It might have been affected by conditions of unusual temperature/humidity. A further bleaching effect is evident too with the enamel washes in certain places; these can be seen clearly. I used both artists spirit and lacquer thinners here. The “eagles” have been particularly affected, and I do remember using additional activator applications on these areas after the initial treatment. I had a real smorgasbord of treatments on the go. If only I could remember what I did, I might be able to replicate it again one day! 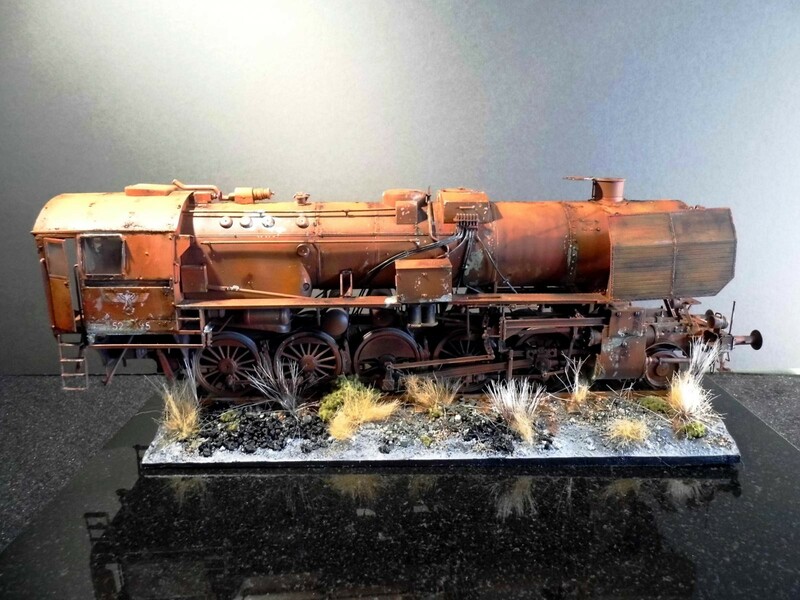 Thanks for the background Rob, if there was a Michelin guide for weathering pros, I think you would deserve your stars! Think I’ll leave it a day or so uncovered, as I’ve misted the landscaped areas with matte lacquer, so don’t want to set off some other chemical reaction! Yet another masterpiece from your bench, Rob…..stunning workmanship, sir. Thanks, Craig, definitely an improvement to the earlier version. 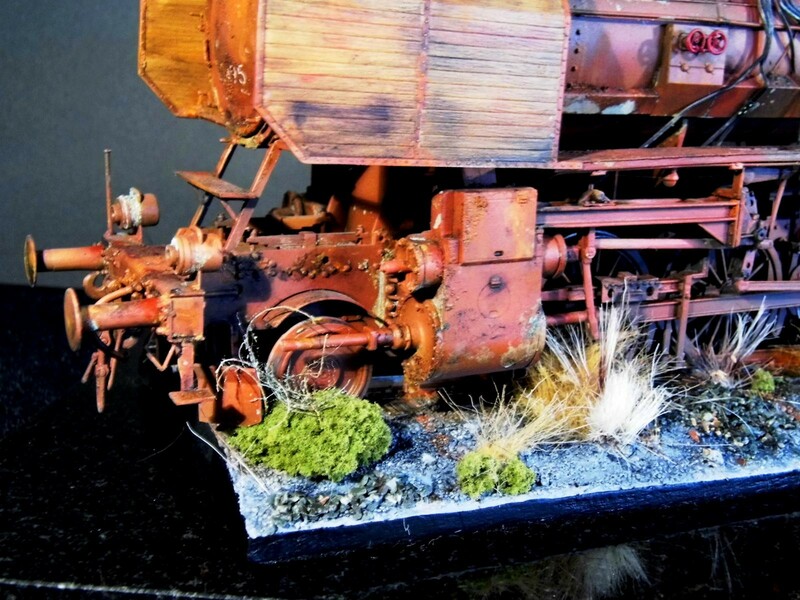 Excellent work Rob, really like the way your weathering and rust affect came out. Well done. 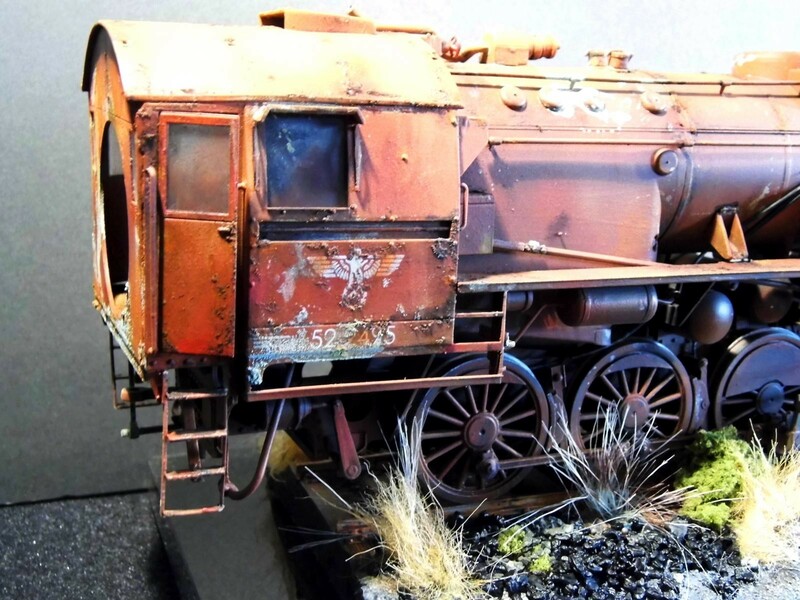 very well detailed, stunning finish/weathering! Love the subject, very unique so u dont see much. 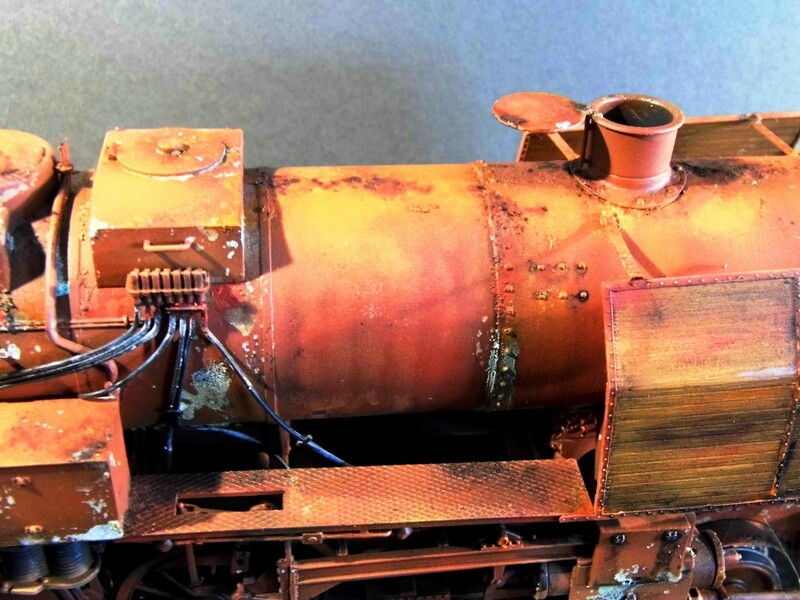 This must of been a challenge with all the detail and the exquisite weathering u applied. Good Job. The kit actually includes a coal tender, but it then becomes a very big model indeed to store/display. Also, the base isn’t the kit base/tracks. 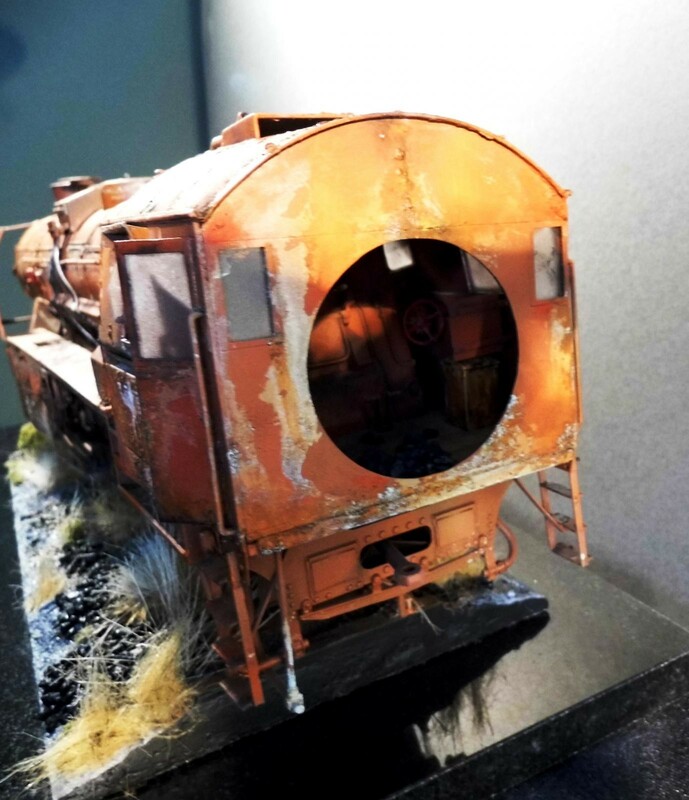 I had a plaster-cast base I wanted specifically for the loco itself, which I could add to, by way of grasses, etc. Rob, Nicely done, I’m noticing a lot of my paint work changes shade after a day or so of drying, I don’t know if it always did this and I never noticed before, or if something has changed in paint production, either way you make an interesting point. As for this project, I still like it, Well done ! Paint usually ‘darkens down’ as the carrier, whether spirit or water, evaporates to leave just the pigment base. Depends on what else you do to manipulate it though, ‘pushing’ the colour to less/greater saturation. You guys who can go Full Craptological are amazing. The only thing it lacked was bullet holes from a strafing. Not that it needed them. That’s fantastic realism there. 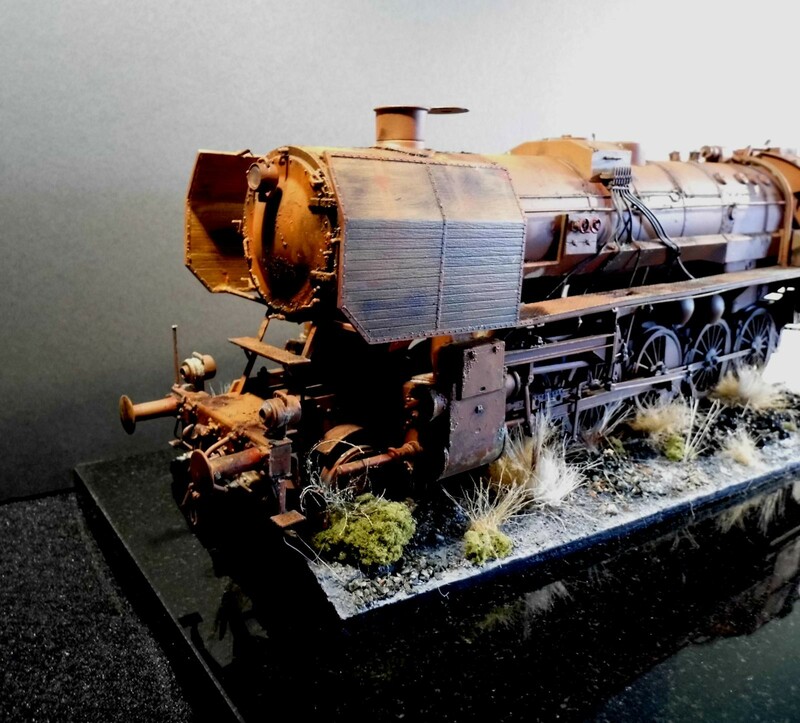 The actual source of inspiration was the train graveyards in the Bolivian deserts, but the techniques are transferable. Cheers, Robert. Thanks for the comment. No excuse needed in my estimation to have another look at this beautiful piece of craftsmanship! You are on fire currently, Rob! I would guess that many who get to this level of ‘distressed’ in a build wouldn’t be able to put anything other than broad recipe together. Whatever you did, it sure worked! Stunning! Thanks, Paul. It wasn’t as haphazard as perhaps I made it sound.